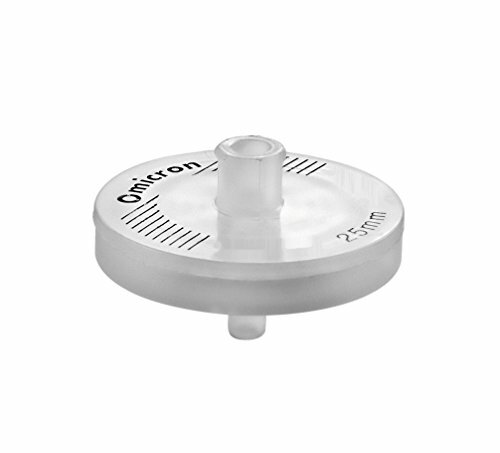 Omicron - PTFE Syringe Filters - Non- Sterile, 25mm, 0.2µm, 1000/pk. THIS PRODUCT IS FOR INDUSTRIAL USE ONLY. THIS PRODUCT IS NOT INTENDED OR APPROVED FOR MEDICAL USE. Retention Efficiency: 0.2 µm -LRV > 7 for Brevundimonas diminuta, 0.45 µm -LRV > 7 for Serratia marcescens. Wettability:Hydrophobic. Effective filtration area: 0.1cm² for 4mm, 0.8 cm² for 13mm & 3.9 cm² for 25mm. Hold up volume: <10 µl for 4 mm, < 20 µl for 13 mm & < 100 µl for 25 mm (after air purge). View More In Syringe Filters. If you have any questions about this product by Omicron, contact us by completing and submitting the form below. If you are looking for a specif part number, please include it with your message.